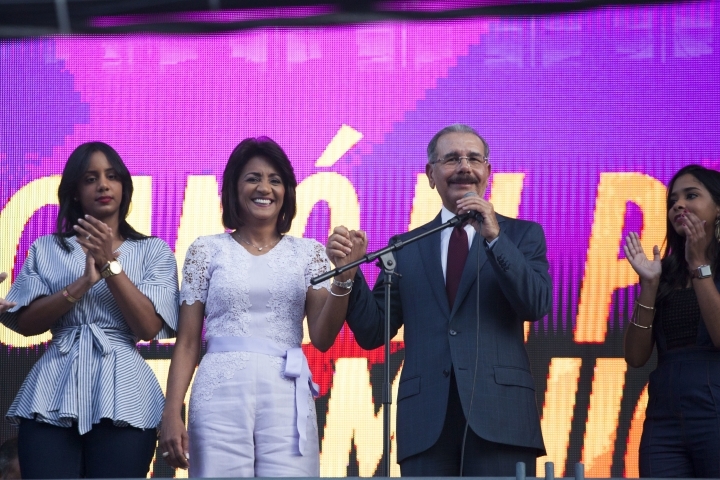 SANTO DOMINGO, Dominican Republic — Dominican President Danilo Medina was sworn in for a second term on Tuesday as leader of a country boasting the best economic growth in Latin America and the Caribbean. The inauguration comes three months after he won 62 percent of the vote, the highest percentage in the country's democratic history. He will be working with a bicameral legislature dominated by his Dominican Liberation Party. Medina has pledged to implement a technological revolution over the next four years by offering more government services online and providing every student and teacher with a computer. He also said he wants to lift some 800,000 people out of poverty and further boost a thriving economy. "We still have a lot of challenges ahead of us," said Medina, who is an economist by training and a career technocrat. He noted that the country's GDP grew 7 percent in 2015 for the second consecutive year, thanks to robust performances in construction, tourism and banking. Medina addressed the legislature, where several seats belonging to opposition legislators were empty. Some protested that Medina's sister is president of the House of Deputies and that one of his close allies is president of the Senate. "How can we guarantee that the House of Deputies will have any control over the actions of the executive branch?" asked opposition legislator Fidelio Despradel. Those who attended the inauguration include Venezuelan President Nicolas Maduro, Spanish King Juan Carlos and Ecuadorean President Rafael Correa.